S-7516-SPRT 16 Hamilton Heavy Duty Gound Support Pneumatic Swivel Caster. 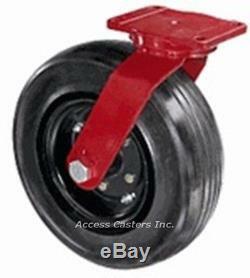 16 Hamilton Heavy Duty Ground Support Swivel Caster. 16" x 5-1/8" Heavy duty solid pneumatic tire with tapered bearings. Designed for ground support tow applications. 6-1/8" x 7-1/2" top plate. 4-1/8" x 6-1/8" Bolt Hole Pattern Drop forged construction. Visit Access Casters' About Me. Casters are to be used for manual operation, consult Access for temp ranges not listed on our website. The item "S-7516-SPRT 16 Hamilton Heavy Duty Gound Support Pneumatic Swivel Caster" is in sale since Saturday, May 20, 2017. This item is in the category "Business & Industrial\MRO & Industrial Supply\Material Handling\Casters & Wheels".